Easy to handle: intuitive activation, low firing force, no lancet loading required, 2 step operation only. Minimized pain ultra-sharp and silicone-coated needle, double spring mechanism to ensure high puncture speed and eliminate needle vibrations. Adequate blood sample precise needle geometry and penetration depth, reliable activation system for perfect blood volume control. 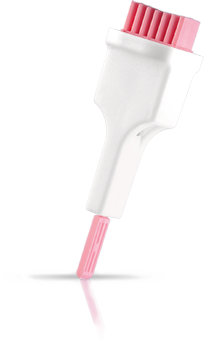 Safe: single use, gamma sterilized, reliable sterility cap, concealing the needle fully until just seconds before the test. Minimized pain: ultra sharp and silicone-coated needle, double spring mechanism to ensure high puncture speed and eliminate needle vibrations. Gentle: Electro-polished and silicone-coated needle is linearly driven to assure lower pain and quick healing. Sufficient to lance once: different color-coded versions, right needle exposure length, adequate blood flow. Self-destructive mechanism: excluding possibility of reuse, sterilized reliable sterility protector. Sterile: Needles are gamma-sterilized, fully covered and protected with a sterility tab. Efficient: adequate blood sample with just single push of the button. Reliable: Risk of misuse or receiving an incorrect blood sample is eliminated through a unique, patented, self-destructive activation mechanism. 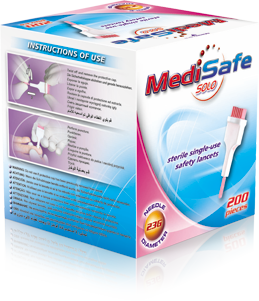 MediSafe Solo 29G assures small sample of blood mainly for the purpose of blood glucose monitoring. 29G needle tip is perfect for children as well as for adults with normal and delicate skin. 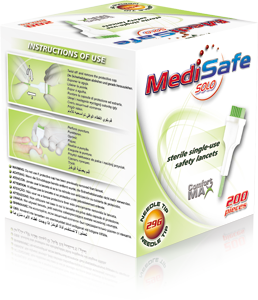 MediSafe Solo is also recommended for the use with modern glucometers where the required blood samples is smaller. 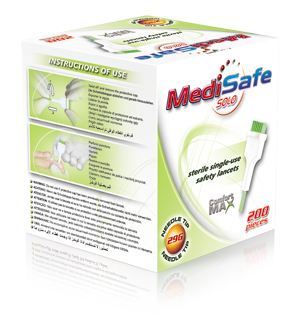 MediSafe Solo 23G is perfect for most of the common tests done with capillary blood including blood glucose, cholesterol, hemoglobin, blood group classification, coagulation tests, virology tests and many others. 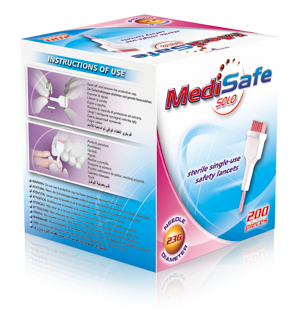 MediSafe Solo 23G can be use with all patients and all skin types. 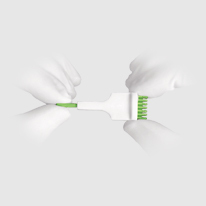 MediSafe Solo Safety Lancet is very easy to handle and its intuitive top button activation minimizes training required for new users. Press the MediSafe Solo body fi rmly against the puncture site and press the push-button to activate the device. Gently apply intermittent pressure near the puncture site to obtain the required blood volume. Patients should wash their hands with warm water and soap before the test. Remember that warm fingers increase the blood flow. 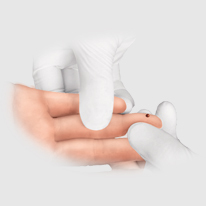 Fingertip test site should be selected slightly off-center to minimize any pain and maximize blood flow. The patient’s arm should hang down below the elbow to allow blood flow to fingertips. 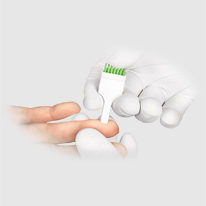 After the blood collection, use a tissue and apply firm pressure directly over the finger-stick site. Discard used lancet into a sharps container in accordance with your local regulations. 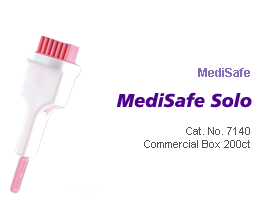 MediSafe Solo Safety Lancets fully eliminates the danger of accidental injury with potentially infected needle and protects healthcare personnel from contamination with severe blood borne pathogens. 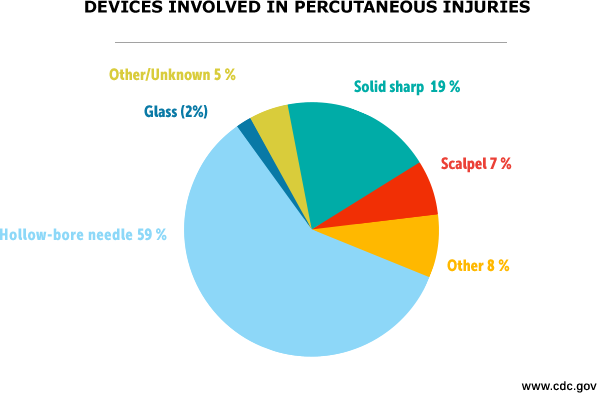 Use of conventional non-safety lancets can be deadly. Do not risk! MediSafe Solo Safety Lancets are available in two different color-coded versions.